So being the superficial generation that we are, you can’t deny that you considered at least once how many likes you got on your last Facebook profile picture change. Well lucky for you, UQES has you covered on getting bulk likes on your next one. 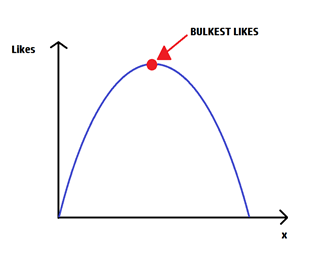 That’s because like any sort of profit or utility function, we can optimise likes for a function of x. But what is x?! Well…there’s heaps of factors that contribute to likes, and thus heaps of possible things that could be x. Let’s look at them more closely. Friends list: More Facebook friends = more likes. But there’s a diminishing return to friends. Just because someone has 5 times as many Facebook friends doesn’t mean they’ll get 5 times as many likes. Tagging: Don’t you love it when you have your m8(s) in your posts so you can tag them? It means your photo will come up in more people’s newsfeeds, increasing your exposure. Bigger audience = higher demand for your photo, just like businesses advertising their own products to maximise their sales. Peak Time: Maximise exposure by posting at the time that most people are scrolling through Facebook. From Sunday through to Thursday nights this peak time is usually around 7-9pm, when everyone’s home from uni and procrastinating. This means you have more chance of getting bulk likes if you post around this time. Friday and Saturday have less of a defined peak time, seeing as people are out actually doing things with their lives. So when we use these factors to our advantage, we increase the demand for our photo. 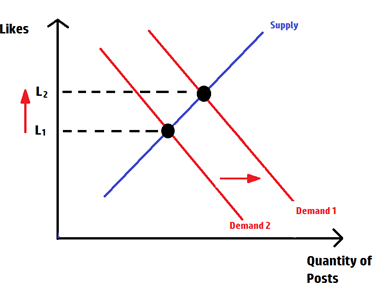 Our demand curve shifts left and the new equilibrium number of likes per post is higher. BUT no matter how much you’re able to increase your likes, you will definitely experience diminishing returns on likes per minute. Sometimes when people post things the like immediate like rate is strong. In the first few minutes they might be getting 2 likes per minute or more. But as the minutes go on, the like rate will eventually decrease. After an hour, they will probably be getting less than one like per minute. After 48 hours, the likes are usually exhausted and the change in likes is 0. All good things come to an end. Cost of Production: The main cost of production, which only really relates to profile picture changes, is time. That time waiting for an event where you actually get a hot AF picture of yourself which is pp worthy. Unfortunately, sometimes this wait is much longer than we would like. 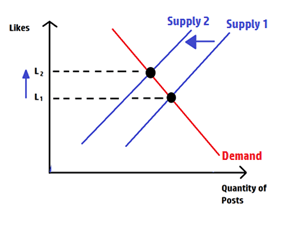 This means our supply of posts decreases, our supply curve shifts left (figure 1). The silver lining about this is that our likes for that one photo we get to post over the year will be pretty high, compared to the likes on each post if we changed our profile picture every week. Excess supply: On the converse, if we decide to start changing it much more frequently, we’re increasing our supply of posts. 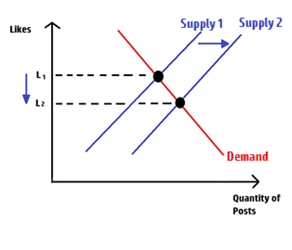 Here, the opposite effect would happen: the supply curve would shift right, hence decreasing our equilibrium number of likes for each post (figure 2). Of course if you don’t care about the likes and you just wanna change your profile picture because you look darn good (you go glen coco), then this effect is irrelevant to your choice of whether or not to change it. So next time you’re thinking about maximising likes on a general photo or profile picture, remember to be rational. May the likes be forever in your favour. We also have to consider the limitation that not possible for all people to see your new photo hence losing potential likes. There is also exception rule as to whether you are good looking at all. An unattractive picture of you is not going to increase your likes no matter what you do- thats a sad truth unfortunately.